What to do with all that HALLOWEEN CANDY? Isn't this the question plaguing good mothers all over America? Here is my answer. 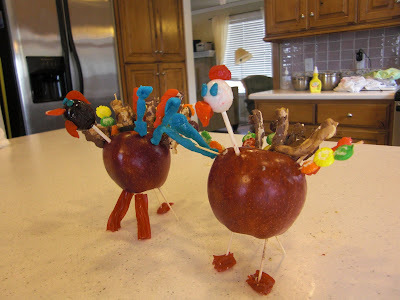 Ring in the Thanksgiving season with these festive candy turkeys. This had to be a stroke of brilliance on my part. Usually a couple weeks before Thanksgiving I buy some gum drops or colored mini marshmallows and we make these fun turkeys. But this morning while pondering what to do with all the Halloween candy, I thought why buy candy in a week or so, when we have candy coming out of our ears right now. 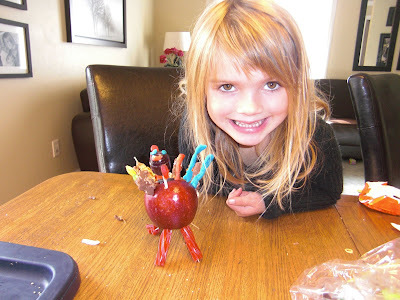 The girls loved cutting up the candy bars and squishing them on toothpicks to make feathers. We also used the skittles, dots, licorice, suckers, airheads...anything we could squish and maneuver onto a toothpick or stick to the apple. Girls had a great time. The vast majority of the candy is gone. Because I am such a nice mom, they get to eat a feather a day. Snicker, snicker. Three skittles is a whole lot better than a whole bag full.